Maureen Smith is a recording artist , songwriter, composer, pianist/ vocalist, solo entertainer, professional musician who founded and developed White Eagle Records Limited. Maureen’s last CD, “Spirit, Songs of Inspiration”, is distributed and broadcast across North America,in addition to worldwide on the Internet. Ras Midas has collectively sold over 750,000 records worldwide. His first international hit single was a Reggae Pop Beat release, “Kudea-A-Bamba”, recorded in English and Swahili for Island Records which sold half a million records worldwide. “Rastaman In Exile” earned album of the year in France in 1982 and sold over 150,000 copies worldwide. Internationally known singer/song writer and reggae artist, Jamaican born Ras Midas has professionally produced dynamic Reggae and Pop Music since 1974. 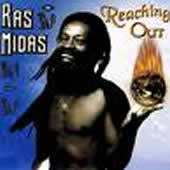 Inspired by the overall acceptance of his music, Ras Midas has just completed his ninth album, “Reaching Out”. Featuring 15 new original tracks it blends the classic roots reggae sound with hip hop dance hall elements.